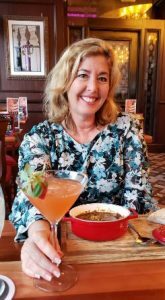 My Assistant Marti & I were invited to The Balcony, a vibrant New Orleans-Inspired restaurant on Las Olas Blvd which opened approximately 8 months ago to check out their new menu which recently launched and now features even more dynamic dishes including some American favorites and tapas for sharing. To celebrate the launch of their new menu, The Balcony is offering a buy one entrée, get one 50% off special on Monday, March 25–Thursday, March 28 from 4–7 p.m.
Our server Myana (pronounced like Bryanna), was super nice and very knowledgeable about the menu items. The cocktail list was quite extensive and loaded with lots of interesting concoctions. Marti had the Sazerac which was made with Angel’s Envy Bourbon, Pernod Absinthe, Peychaud’s Bitters & Lemon ($15) I opted for the Pink Pearl which was made with Stoli Elit Vodka, Disaronno, Fresh Strawberries & Lime ($15). They were both excellent. Off to a great start. Then GM John and Chef Simon came over to welcome us and let us know that they would be sending out a variety of items for us to try and informed us if there was anything else we saw on the menu that we wanted to try, we were welcome. We were in for a treat for sure! First out was the gumbo soup. This soup hit all the right notes and flavor profiles for me. It was a great surprise since I had never been one to fancy gumbo before. The warm crusty bread was a nice compliment as well. Great job, Chef! Next up was the Natchitoches Beef Pies (beef empanadas). Natchitoches is a city in Louisiana that is famous for making these little pillows of heaven. They were packed with flavor and I enjoyed the garlic dipping sauce it came with. The other sauce, we were given advance warning, was hot so I stuck to the garlic one. The crab cakes were not only adorable but very tasty. The perfect shareable dish. Chef sent out their signature salad, the Mardi Gras Peach & Berry. What a gorgeous salad; it just popped with color. Chef Simon explained to us that he pickles and poaches the peaches in the peak of season so that he is able to use them year round. We both really liked the freshness of each component of the salad. Our next tasting was the Baton Rouge Beef Sliders and the Shrimp Po Boy. The beef sliders were topped with housemade bacon jam, abita beer cheese, caramelized onion and pickled serrano (I actually didn’t know there was a serrano pepper in there, so if you’re a wimp like me in the spice/heat department, don’t worry). This burger was THE BOMB!!! I am love with it for sure. The Shrimp Po Boy, on the other hand, lacked a little flavor for me and out of all the dishes we tried, was my least favorite. But not to worry, we got right back on track again with the Lobster Bisque made with cognac cream. It was heavenly and I would highly recommend this dish. It ranks up there as one of my favorite lobster bisques of all times. Marti had never tried fried green tomatoes before and I’m a fan when done right and boy did these deliver in the flavor department. They too, raised the bar on which all fried green tomatoes will forever be judged. OK, I’m sure by now you’re wondering how in the world we could still fit anything into our bellies, right?!? Well, we couldn’t resist at least trying a beignet. When you think of beignets, most undoubtedly the famous place in New Orleans, you know the one comes to mind. After popping one of these lovelies in my mouth, I just closed my eyes and within seconds, I began to feel as if I had been transported to New Orleans. These beignets were served with 3 unique dipping sauces; berry jam, spiced chocolate and orange marmalade. 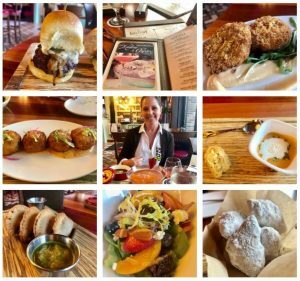 Besides the Lobster Bisque, other new menu items include Vegetable Dumplings, Braised Meatballs, Chicken Cobb Salad, Oyster Po’Boy and more. Tapas: Vegetable Dumplings with sweet serrano chili sauce ($12), Coconut Crusted Shrimp with sweet mango serrano sauce ($15), and Braised Meatballs with house made tomato sauce ($13). Salad: Chicken Cobb with avocado, Applewood smoked bacon, Point Reyes blue cheese, egg, heirloom tomato, romaine lettuce, and creamy Cajun dressing ($14 on lunch menu; $16 on dinner menu); Seared Ahi Tuna with heirloom tomato, cucumber, arugula, and lime dressing ($16 on lunch menu; $18 on dinner menu). Hand Helds: Oyster Po’Boy with heirloom tomato, lettuce, Meyer lemon remoulade, and fries ($15 on lunch menu; $16 on dinner menu); The Burger with lettuce, tomato, onion and fries ($1 add cheese, $2 add Applewood smoked bacon) ($12 on lunch menu; $14 on dinner menu). Sides: Mash ‘n’ Collards with Applewood smoked bacon, mashed potato, and collard greens ($7); Fries with moonshine ketchup ($5); Mashed Potatoes with cream and butter ($6); and Sautéed Brussels Sprouts with pecan maple glaze ($7). Main Plates: Half Roast Chicken with red beans and rice ($19); Shrimp ‘n’ Grits with Carolina BBQ shrimp and cheese grits ($26); 8 oz. Filet Mignon with Mash ‘n’ Collards, crispy onions and Madeira sauce ($32); 14 oz. Prime New York Strip with sautéed mushrooms and fries ($38); Grilled Salmon with corto poached potatoes, sautéed Brussels sprouts, and Meyer lemon herb butter ($28); Grilled Ahi Tuna with glass noodles, stir fry vegetables, and sesame seeds ($36); and Pan Seared Chilean Sea Bass with corto poached potatoes and Sicilian ragout ($39). Side: Glazed Sweet Potatoes with toasted pecans and marshmallow ($7). 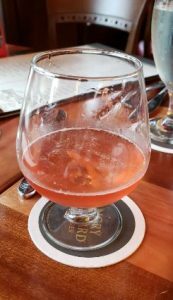 Some noteworthy mentions: Sunday Jazz Brunch, “Sip, Tipple, Savor” Happy Hour (1/2 off drinks and bar bites, M-F 4-7pm), Tableside Crepes Suzette and Bananas Foster every day after 4pm. There’s actually more, so to get a complete list or for more information about The Balcony and its new menu, visit www.thebalconylasolas.com or call (754) 200-6344. 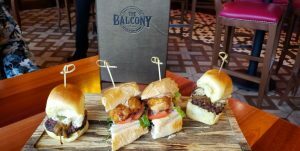 The Balcony, a PDKN Restaurant Group concept, offers a New Orleans-inspired restaurant with a twist. 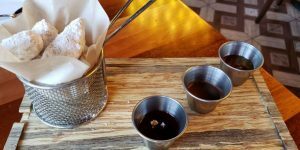 Located on trendy Las Olas Boulevard in Fort Lauderdale, this two-story restaurant features the dynamic tastes of New Orleans, which blends French, Spanish, West African, Amerindian, German, Italian, Irish and Vietnamese ingredients. Guests enjoy New Orleans-style small plates, craft cocktails and live music. 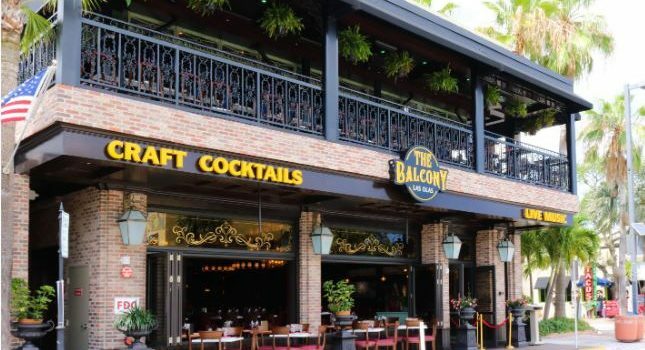 The Balcony is owned by former Miami Dolphins player Kim Bokamper and his three partners, who also own Bokamper’s Sports Bar & Grill, with locations in Fort Lauderdale, Miramar, Plantation, Naples, and Estero. The Balcony is located at 1309 E. Las Olas Boulevard, Fort Lauderdale FL 33301. The restaurant is open Monday-Wednesday from 11:30 a.m. to 1 a.m.; Thursday-Saturday from 11:30 a.m. to 2 a.m. and Sunday from 10:30 a.m. to 12 a.m. For more information, visitwww.thebalconylasolas.com or call (754) 200-6344. PDKN Restaurant Group was founded by former Miami Dolphins player Kim Bokamper and his three partners, P.J. Kavanagh, Damon DeSantis and Noel Cullen, in 2008. Following Bokamper’s successful sports and broadcasting career, he was approached by current partner Kavanagh about furthering his brand through a restaurant. The first Bokamper’s Sports Bar & Grill was founded in 2008 in Plantation, Florida. Today, the group owns five Bokamper’s restaurants locations in Florida: Fort Lauderdale, Plantation, Miramar, Naples, and Estero ― all dedicated to providing exceptional service, great food, and an unparalleled atmosphere for friends, families and sports fans of all ages. 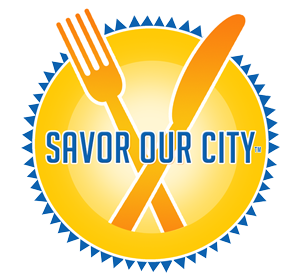 PDKN Restaurant Group also owns and operates The Balcony, a New Orleans-inspired restaurant on Fort Lauderdale’s Las Olas Boulevard and Bo’s Beach, featuring fresh seafood and stunning ocean views on Fort Lauderdale Beach.